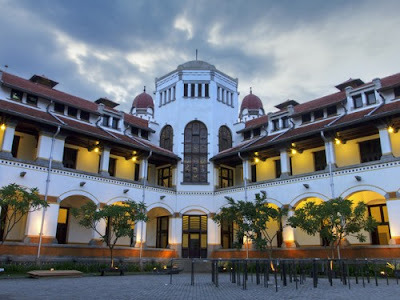 Java's north-coast port of Semarang is the capital of the province of Central Java Province, a city blessed with an alluring atmosphere, bearing witness of diverse cultural heritage from those who had played their part in its precious history. Here the Middle East and Gujarat heritage radiate strongly from the Pekojan – Kauman district, the chinese ancestors who came and settled in Semarang left some of their most oriental legacies in the alleys of Kranggan area, otherwise known today as Pecinan or Chinatown. In another quarter, The European touch brought by the Dutch during the colonial era remains carved in the buildings at Jl. Letnan Jenderal Soeprapto Street, Tanjung Masarea in a complex known as The Oudstad or the Old Town, a Dutch colonial heritage site not unlike the area in Jakarta called the Old Batavia. Taken from the old Dutch language, the Oudstad is sometimes referred to as 'Little Netherlands' that has been included in UNESCO's World Heritage Tentative List (http://whc.unesco.org/en/tentativelists/6011/). Semarang's Old Town is recognized as one of the best preserved colonial cities with remarkable testimony of important historical timelines in history – with particular reference to economic, political and social aspects in South East Asia and the World. 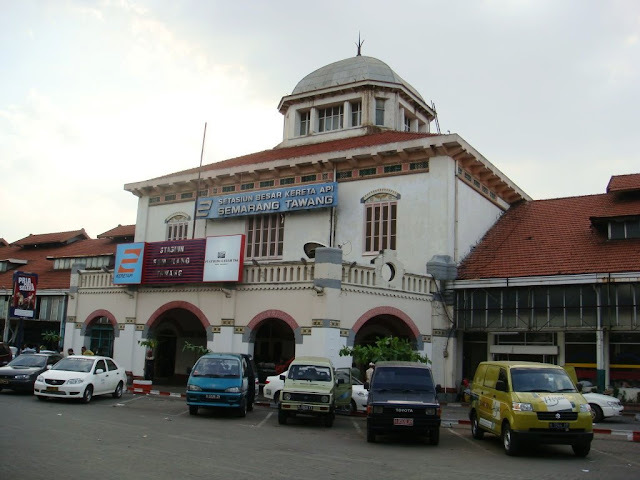 Established in the 18th century when Indonesia was a Dutch colony, its location is currently separated from the more modern residential districts. 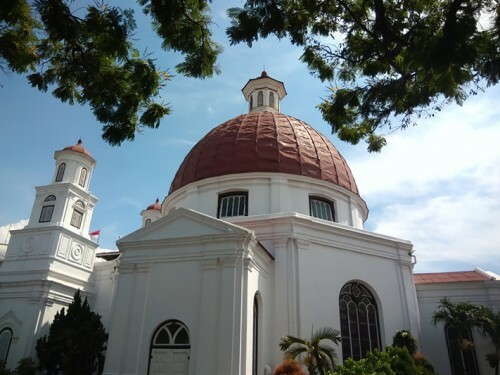 At the heart of this quarter is the elegant Gereja Blenduk or Blenduk Church, meaning the Domed Church. This is the oldest Protestant church in Central Java. Surrounding Blenduk Church, are over 50 well-maintained colonial buildings in the Old Town complex, displaying distinct 18th century European architecture. 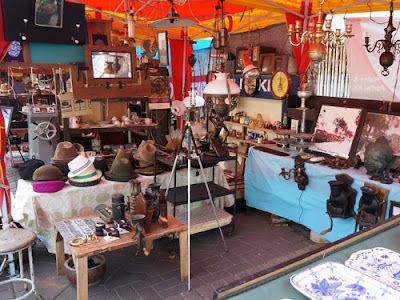 The Old Town is also popular for those looking for antiques and vintage items like old gramophones, Dutch coins, old telephones, typewriters and the like, for here is also the Antique market. Also near here is the Tawang Train Station that stil in use until today, connecting cities along the north coast of Java, from Jakarta in the west all the way to Surabaya in the east. 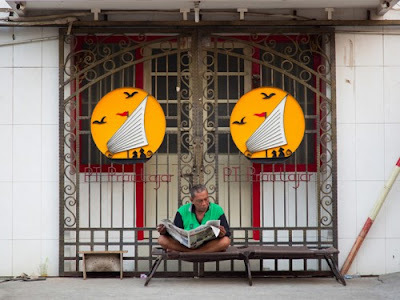 Right at the heart of the complex, at the Old Town's intersection between jalan Glatik Street, Jalan Garuda Street, and the main Jalan Letjen Suprapto Street is an iconic spot frequently appearing on photographs. Rows of antique buildings in their original state decorated by 'becak' traditional trishawslining the street, perfectly portray the classic ambience of the complex. Stepping into the Oudstad, visitors will definitely be taken back in time into a 200 years' nostalgic trip. It all started at first with the establishment of the VOC fort that was constructed along the Semarang riverbank. The fort has five bastions, so that it is popularly known as De Vijfhoek or the Five Corners bastion. When the fortified wall was demolished in 1824, a modern commercial business area rose at the site. The Industrial Revolution also triggered acceleration in the development of the region. Simultaneous with the opening of investments for foreign private firms, this ex-fort area became crowded with commercial activities that included the loading and unloading of goods. The site came to be dominated by office buildings, warehouses, stores, banks, and foreign consulates. Infrastructure development also received attention, such as the widening of the Semarang riverbanks, the construction of a new harbor, and establishment of a reliable transportation system for the public and for goods. Slowly but surely, the city began to expand, and along with it, further development shifted to the southern section of the city, so that the former fortress region came to be known as the Old Town or de Oudstad. Today, Semarang Old Town has become a definite favorite stop on the tour of Semarang , especially for cruise ships calling on the port for passengers to disembark and take a tour to the magnificent Borobudur temple. The area is particularly attractive for Dutch tourists and other Europeans who seek the nostalgic past as lived by their parents and grandparents in the Far East of yore.